XS energy drink is a brand of energy drink manufactured and distributed by Amway in the United States. 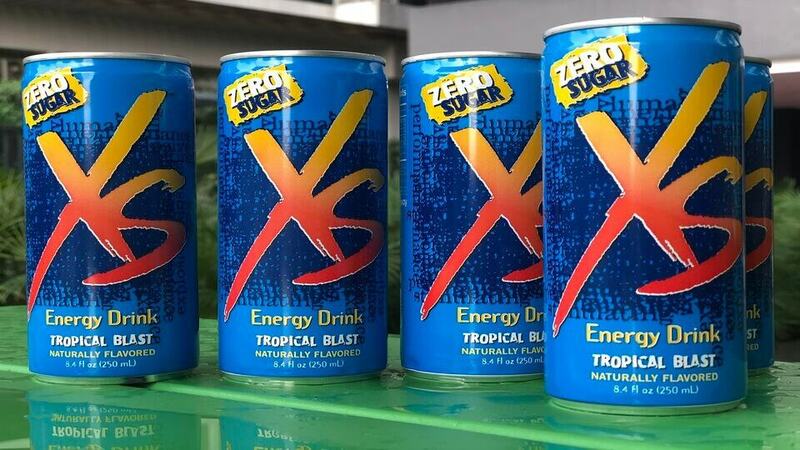 XS is available in a wide variety of flavors in regular 8.4 fl.oz cans, but each can contains 80mg of caffeine. An 8.4 fl.oz can of XS Energy Drink. Each can also contains the following ingredients, but the amounts of each of these are NOT specified. As a result, it's unclear if they are only present in traces or if they are present in significant quantities. Some energy drink brands include nice-sounding (and healthy) items in their list of ingredients, but when you look closely you'll find that those good ingredients are only included in very small quantities. XS Energy Drink nutrition facts. If you think 4,900% of the daily value of vitamin B12 is a lot, take a look at Zipfizz energy drink with a whopping 41,667% of the daily value of B12. 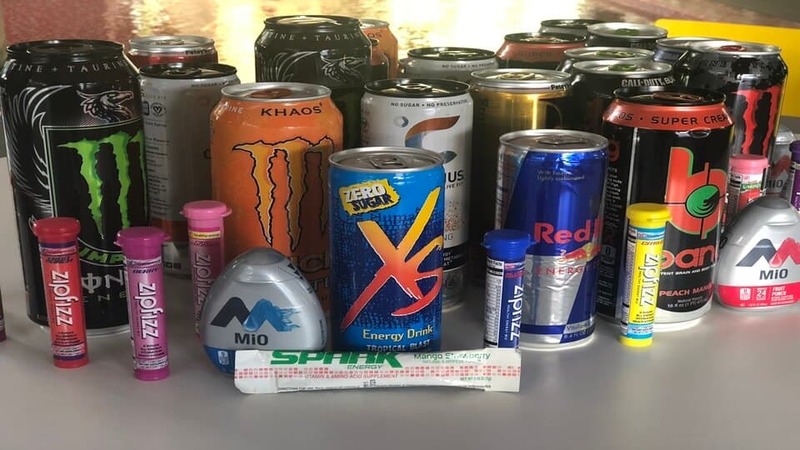 Each 8.4 fl.oz can of XS energy drink contains 80mg of caffeine, to illustrate, that's roughly comparable to a small coffee. A 12 ounce can of XS contains 125mg of caffeine, thus approximately equivalent to a regular cup of Joe. Check this article out to see how that compares to some of the strongest energy drinks on the market. 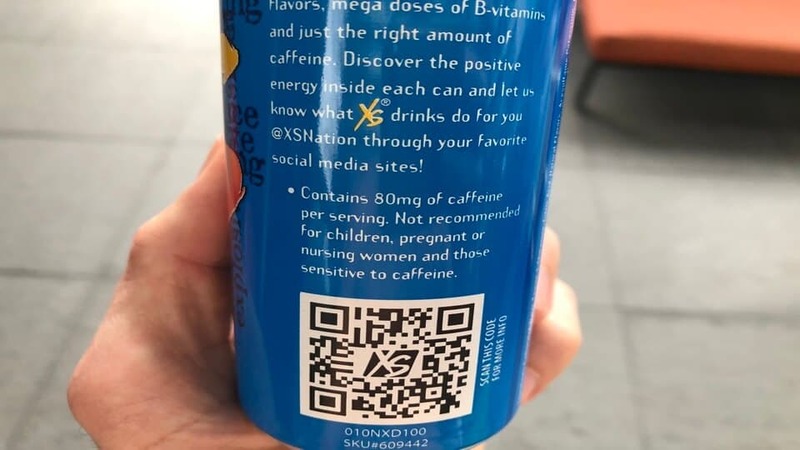 Each 8.4 fl.oz can of XS Energy Drink contains 80mg of caffeine. XS contains 300% of the recommended daily dose of vitamin B6 and a staggering 4,900% of the recommended daily intake of vitamin B12. This may sound great, but it's actually wasted. B group vitamins are water soluble. Consequently, our bodies can't hold any more than 100% of the daily requirements. What happens to the other 4,800% that we get in a can of XS? It passes straight through us and into the toilet on our next visit. Oh, it also makes our pee bright yellow. Although B vitamins are water soluble and are generally not a health risk from over-consumption, there is some evidence to suggest that extremely high levels of B group vitamins can be harmful. XS energy drink "natural ingredients"
Each can of XS features large "naturally flavored" font on the can. The problem is, on the list of ingredients they simply list "natural flavors" with no additional information about what is included, nor how much is included. However, a closer look at the ingredients shows that XS also contains artificial ingredients for the purpose of "flavor". Seems they neglected to tell us that it ALSO CONTAINS ARTIFICIAL INGREDIENTS. But hey, you didn't ask, so they aren't going to tell you. Perhaps they should erase those big "naturally flavored" words from their can. At any rate, being a little more transparent about their ingredients would be a welcome move. Sure, it might contain natural flavors (but they don't say what or how much), but it also contains artificial ingredients too. Kind of defeats the purpose of splashing "naturally flavored" all over your can, wouldn't you say? Is this just another marketing trick? 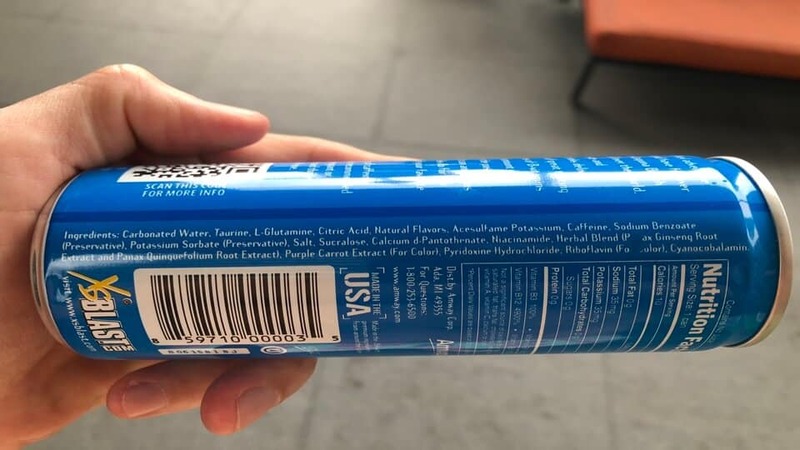 Sure, XS might contain "natural flavors", but don't for a moment make the mistake of thinking that it only contains natural ingredients, because there are plenty of artificial ingredients included in the can too. 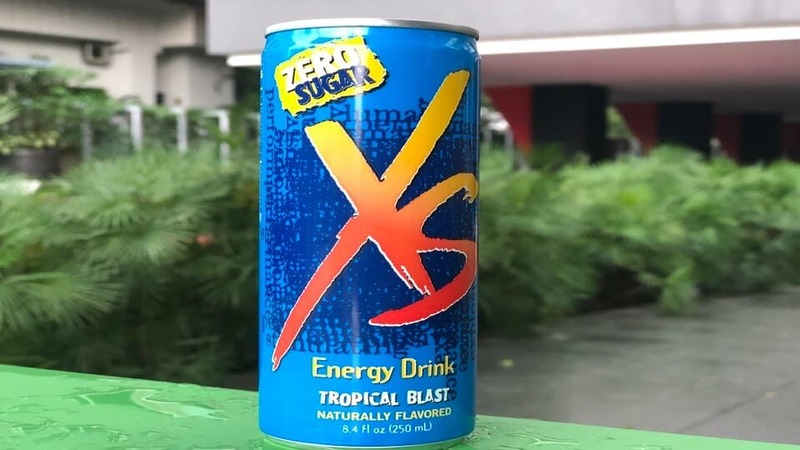 The XS can proudly boasts "naturally flavored" in capital letters... There is no mention of the artificial ingredients also included. 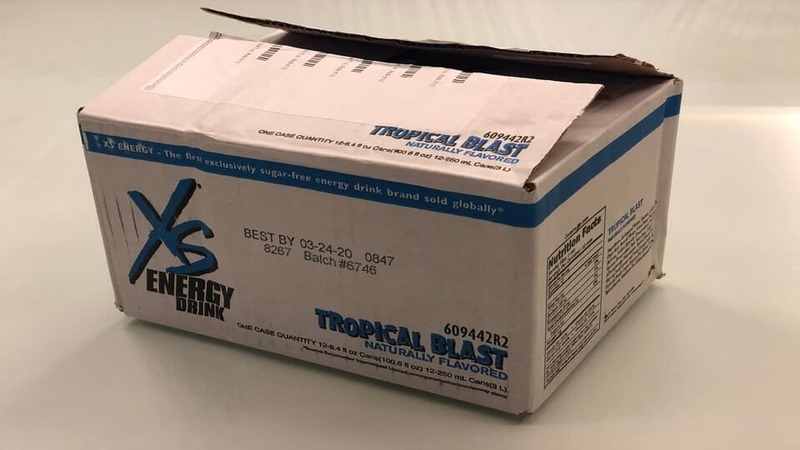 Tropical blast is just one of the 18 different XS energy drink flavors. The XS energy drink ingredients includes something called "herbal blend". Energy drink brands often invent their own combination of regular ingredients and give it a unique name. They then trademark that name, then they are the only ones who can use it for marketing purposes. But the truth is that the ingredients that make up these fancy-sounding blends already exist and they aren't inventing anything new. In other words, they are just creating a catchy sounding name for that precise combination of ingredients. XS have done exactly that with their "herbal blend", however, they've kept the ingredients list quite short. What's in the XS energy drink herbal blend? Unfortunately, we don't get any more information than that. The XS can doesn't shed any light on how much of these great-sounding ingredients are actually inside the can. They could be in tiny traces for all we know. Indeed, on the list of ingredients "herbal blend" is listed several ingredients after "salt", better known as "sodium" to the scientific community. The nutrition panel shows that there is only 35mg of sodium per can, therefore, we can deduce that "herbal blend" is present in less than 35mg in total. Whether it's close to 35mg, or much less... that's still only a very small amount. The list of XS ingredients showing "herbal blend" towards the end suggests that it is only present in small quantities. 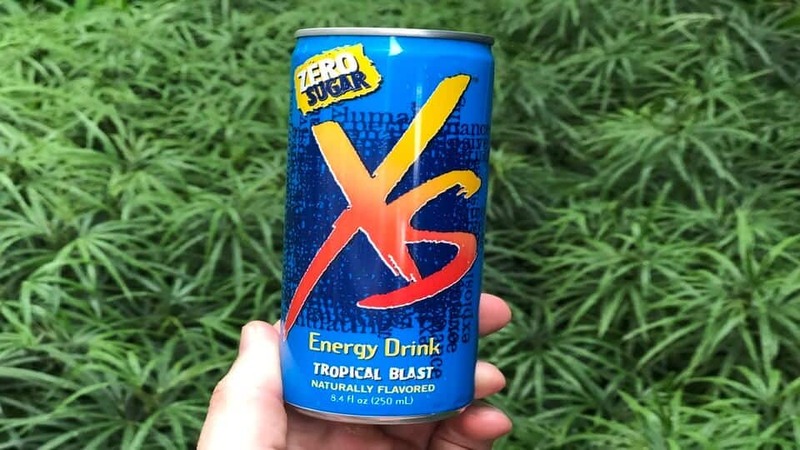 XS is sold by "independent business owners", backed by Amway. 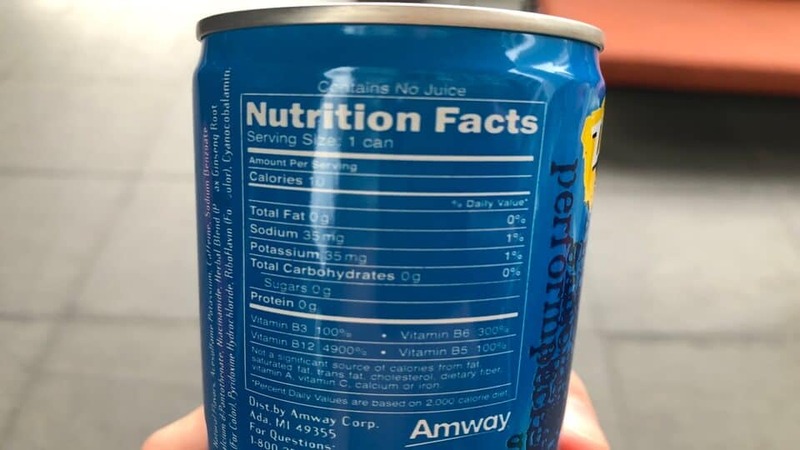 Amway is famous for being a giant multi-level marketing company and XS energy drinks are no exception to their business model. The Amway business model has even been described as a pyramid scheme. Everyday people like you and me buy XS in bulk and then try to sell it anyway that they can. Family, friends, on Amazon or Ebay. Anything that will move product is fair game to make a buck. The drawback of all of this if you are trying to buy XS energy drink is that all of these "independent business owners" need to make a profit, as do Amway. The result is that XS energy drink is considerably more expensive than many other brands, and probably a lot more expensive than it should be. • You can buy XS energy drink on Ebay. • You can find some good XS energy drink deals on Amazon. • Bevnet are selling XS, but it looks like they are just affiliates for Amazon sellers. That's an interesting idea. Adding an affiliate into Amway's already over-priced multi-level marketing scheme. Am I the only person that finds that a little bit amusing? You can also buy XS energy drink online directly from the Amway website. They offer a pack of 12 cans for anywhere between $27 - $36, depending on which flavor you want. Adding $10 for shipping brings the total for twelve XS energy drinks to $37 - $46, therefore a single 8.4 fl.oz can costs $3 - $4. That sounds awfully overpriced to me. This cringe-worthy video is trying to encourage people to become resellers of XS energy drink. I paid $39.62 for a pack of 12 tropical blast flavor on Amazon. That's including shipping to my door in Florida, and comes out to a total of $3.30 per 8.4 fl.oz can, which I consider to be pretty darn expensive. I shopped around before buying for that price, but it looked like that was the best deal I could find online when I made my purchase. This highlights why I don't like multi-level marketing schemes - they make the product ridiculously expensive just so that the person selling it (and also Amway) can both make a profit. I prefer to buy direct from the energy drink brand to cut out the middleman, thus saving myself money. At $3.30 per drink, XS energy drink is definitely at the more expensive end of the range of energy drink prices. It's also more than 3 times the price of REIZE Energy Drink. The box that twelve XS energy drinks arrive in. I bought a 12-pack of Tropical Blast flavor. I was hoping to get a reasonably priced variety pack, but everything was so expensive that I ended up settling for the cheapest deal I could find... which wasn't exactly cheap at $39.62. My 12 pack arrived in a small box. Nothing special, but also not a disappointment. The cans themselves don't feel premium, but they do just fine. Some other energy drink cans look awesome and feel a little bit special, but the XS can doesn't look amazing and actually looks a tad mass produced (which I guess it actually is). 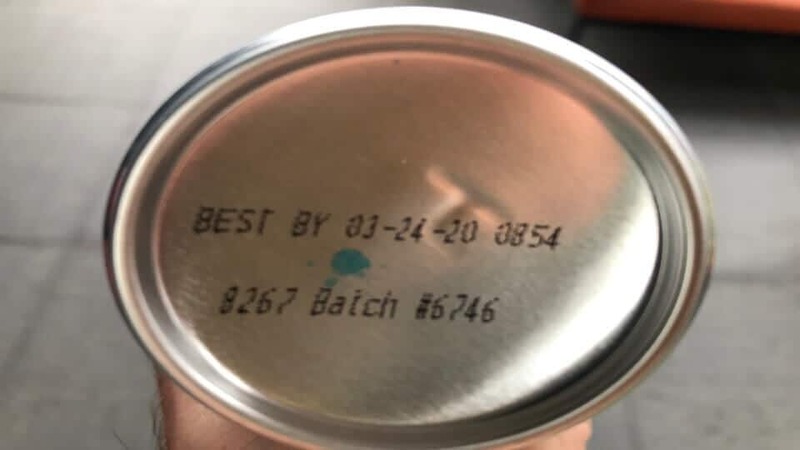 The bottom of the XS can shows the batch number that it was produced in. I poured a cold can into a glass and was surprised to see that there wasn't much carbonation and only some gentle fizz. It seemed to be almost flat as soon as it came out of the can, which I don't necessarily mind, but I don't find interesting. Tropical blast flavor has a few bad reviews online, but in my first taste I thought "Wow, this is good, what are those bad reviews on about??". But then a moment later I got the artificial after-taste and I understood why. Overall, I would say that the taste is good, but you do need to put up with a bit of a "tinny" artificial aftertaste which puts a significant dent in the overall taste score. How can something that only contains "natural flavors" taste so darn artificial? Perhaps because it also contains a list of artificial ingredients, as I already talked about above. All things considered, I would give XS a 7/10 for taste. I'm willing to tolerate a little bit of an aftertaste because I would prefer that to drinking something full of sugar, but perhaps I'm being a little bit generous. Because it was only a small, 8.4 ounce can and it didn't have much fizz, I was able to chug it down in a matter of moments. Freshly poured XS energy drink doesn't have much fizz to it. Does XS energy drink work? In terms of effects, I would say that I got a gentle energy boost about half an hour after drinking it which lasted for a couple of hours. I didn't notice any crash, which is one of the great things about sugar-free energy drinks in general. It's hard to quantify the boost that I got from the drink, but it was subtle, which I much prefer to something extreme that blows your head off. I give XS energy energy drink a 5.0 out of 10 for price, taste and the overall energy boost combined. It tastes fine and gives a subtle energy boost, but it just costs wayyyy too much. What are other people saying about XS? This is a particularly bad review of XS energy drink, and there are plenty more here too. This one wasn't as harsh. To balance things out, if you go to Amazon and filter customer reviews to only show the 5-star reviews you'll find a long list of happy customers. There are lots of good alternatives to XS energy drink if you're willing to search for them. XS energy drink is good, but there are plenty of other top energy drinks out there to try too. If cans and powders aren't how you like to stay caffeinated, you may want to look at something like Make it Mio drops or caffeine pills to get your energy boost. Just remember to always consume energy drinks in moderation. XS energy drinks are pretty good. They are available in a huge variety of flavors, which means that you don't have to search for very long to find one that you like. It gives you a nice energy boost, it's sugar-free and contains a sensible amount of caffeine. However, there are a few things that I'm not a huge fan of. Firstly, I wish they would remove the huge NATURAL FLAVORS from the front of the can. It's misleading because XS also contains plenty of artificial ingredients. 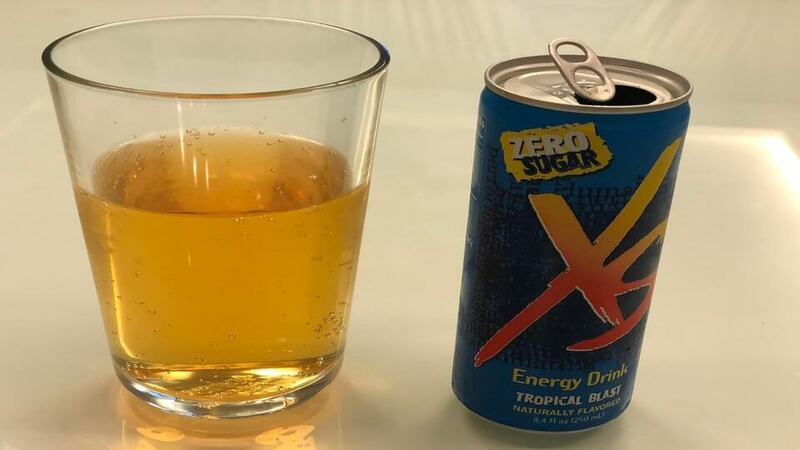 I don't care if XS contains some artificial ingredients, however I wish they would stop trying to market it as a natural energy drink. Second, and this is the deal-breaker for me, the price is way too high. There is absolutely no reason to pay more than $3 for a can of energy drink. Heck, even $3 is far too expensive in my opinion, but perhaps I'm just too used to paying only $1 for my energy drinks. Lastly, and this is only a minor point, but still a bugbear of mine - I hate paying for shipping. Adding $10 to my order total when I'm only buying a dozen 8.4 ounce cans seems like a kick in the teeth and adds significantly to the per-can cost. But overall, XS energy drink is a leading energy drink brand for a reason - they are pretty darn good. If you're looking for a great alternative to XS energy drink that ships right to your door for around $1 per drink, tastes great and is also sugar-free, then you might want to give REIZE Energy Drink a try. REIZE is the smarter choice and you might just find that you prefer it to XS.